I read a description of the plot and was intrigued. I read some viewer comments and was amused. Seeing the film was no longer a question of if but of when. In a nutshell - this isn't really a spoiler; consider it a tickler - an Englishman arrives in a small Italian town to give a lecture tied to the publication of his latest book. He talks about the difference between original art and copies and whether or not there is a difference between the two. If the counterfeit is a copy of the original, the original is merely a copy of reality. Hence, isn't everything both original and a copy? A French woman living in the town attends the lecture and leaves a note to meet the author at her shop. They spend the afternoon together before he has to catch his train. During their time together, they stop at a café and a woman behind the counter mistakes them for a married couple. The two of them then play act at being a married couple for the rest of the afternoon. Is this a real couple or a counterfeit? Does it matter? What I thought was intriguing was the idea of the couple only just meeting and play-acting as if they had been together for years. What I found amusing was how some comments were very negative saying something like "There's no plot!" Unlike your action adventure with car chases and special effects, this is more of an "art film" and I hope that by using the expression "art film", it won't be misinterpreted as meaning artsy fartsy which has a negative connotation. No, this is a psychological drama, a slow dissecting of the human psyche as we watch the interplay of our two protagonists. The action is subtle. The nuances are delicate. It is the understated flavour of fettuccine in a creamy Alfredo sauce in comparison with a plateful of suicide hot chicken wings. Pay attention, eat slowly, savour each mouthful, or you are going to miss the restrained but very active tone of the movie. The film is both written and directed by the Iranian film maker Abbas Kiarostami. I confess I am not familiar with this gentleman, but as a first example of his work, this film will lead me to see more. Juliette Binoche, the French actress, plays the female lead while the male lead is played by William Shimell, an operatic singer, who is making his film debut in the picture. It is a curiosity to note the use of language in the film. I went with the impression I was going to be watching a film in French with sub-titles. Instead, part of the film is in Italian with sub-titles - it takes place in an Italian village - but most of the dialogue is in English. Some is in French, but most is in English. I would be more inclined to say it's an English film with some French and some Italian. Purtroppo non parlo italiano, but it does sound nice. I must say that while the idea of the two of them just meeting and pretending to be married sounded like one of those playful things one may do as a way of savouring the possibility of further intimacy, the movie had moments which were a little disturbing. Rather than the warmth of potential romance, the play acting had them actually having some spats just like a real married couple. Then again, maybe this was nothing more than their real personalities coming out and showing that as a couple they, like anybody, would have problems of adjusting to one another. Or maybe they should never get married at all! At the end of the afternoon, I was beginning to wonder if the hidden message in all this was that they were actually married and the man had left the woman years ago and this was merely a chance meeting between divorced people. Who knows? I mention the director as he is Iranian. So far, he has had a remarkable career and although he resides in Iran, he is fortunate enough to move freely in and out the country for his work. In researching this article, I discovered that fellow Iranian director, Jafar Panahi, had been arrested by the Iranian regime supposedly for making a film against the regime following the election debacle of 2009. In December 2010 he was found guilty of crimes against the regime and sentenced to six years in jail and a twenty year ban on making films or giving any form of interview whether to Iranian or foreign journalists, and leaving the country. I am pointing this out as an indication of the dangers which exist in Iran with its current regime. Kiarostami has managed to strike an accord with the government but Panahi choose to side with the protestors after the 2009 election and is paying dearly for it. Que la seule chose qu'elle demande, c'est que vous marchiez à côté d'elle et que vous posiez votre main sur son épaule. Rotten Tomatoes, my favourite rating system, gave the film 88% which is right up there. I would strongly advise you to see the film, but if you're going to haul your boyfriend, husband, or "male" significant other out, remind them that this is more of a chick flick: no car chases, no special effects. Okay, tell them Juliette Binoche is hot, but in a subtle, nuanced way. 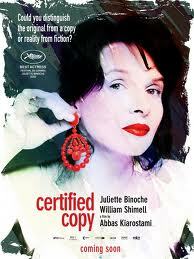 Certified Copy (French: Copie conforme) is a 2010 film by Iranian writer and director Abbas Kiarostami, starring Juliette Binoche and the British opera singer William Shimell, in his first film role. The film is set in Tuscany, and focuses on a British writer and a French antiques dealer, whose relationship undergoes an odd transformation over the course of a day. The film was a French-majority production, with co-producers in Italy and Belgium. The dialogue is in French, English and Italian. Abbas Kiarostami (born 22 June 1940) is an internationally acclaimed Iranian film director, screenwriter, photographer and film producer.